APPLICATION: Large Alumi-Flash Base with C-182. Fits 8-12" penetration in one watertight unit. Alumi-Flash makes pitch pans obsolete! Portals Plus Alumi-Flash consists of a flexible EPDM cap w/Stainless Snaplock Clamp(s) and a one piece, spun aluminum base. SPECIFICATION: The LARGE Alumi-Flash base is 22" OD and 14" ID with a height of 4". The 14" collared opening has two beaded sealing rings roll formed into the top edge. 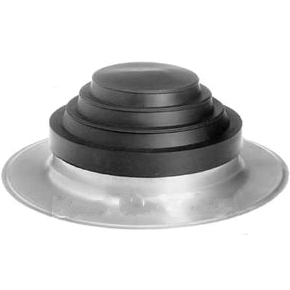 An EPDM compression molded cap model C-182 is included which fits ONE pips of 8 to 12" diameter. All Caps have Portals Plus' stainless steel Snaplock Clamp.